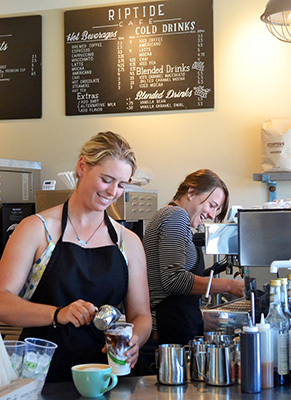 Located just steps from the San Juan Island ferry terminal in the quaint village of Friday Harbor, Riptide Café is the only coffee shop along the Friday Harbor waterfront. Stop in to have a freshly brewed cup of Stumptown Coffee, sample our baked-fresh daily scones, muffins, and sweet breads highlighting natural and organic ingredients. Pair Friday Harbor’s best coffee with our in-house featured local baked goods from Bakery San Juan, Felicitations, andSeattle Bagel Bakery.